Last Sunday, April 12th I had the pleasure of going to see Herbie Hancock and Chick Corea play duo at Boston Symphony Hall. This concert was incredibly special to me. The tickets to this show were my 18th birthday present (I'm turning 19 next month, so I've been waiting a year for this concert!). Also, I just knew it was going to be a special night. I've seen Herbie at his Harvard lectures, the Boston Book Fair, and at the Newport Jazz Festival. I've seen Chick at the Wilbur Theater and at the Newport Jazz Festival. But, with this duo, two heads were definitely 'better than one'. So with this profound experience, and Jazz Appreciation Month, I wanted to share some lessons that I learned that I think can apply to anyone. 1. Herbie and Chick taught me that improvisation is a culmination of life experiences. The concert started out with a completely full house at Symphony Hall. I go to see the Boston Symphony frequently, but I have never seen the hall so packed. When Herbie and Chick came on stage, the entire audience erupted in applause. Herbie went to the mic, and said that they didn't plan what they were going to play: they were going to improvise. So, they both went to their pianos, and with a chuckle they did just that: they improvised. This moment of the concert made me reflect on what improvisation really is. And I think seeing them just improvise is what inspired me so much: I wasn't just hearing that moment, I was hearing a culmination of their life experiences! Their choices in that moment were informed by their previous choices and so on. 2. Herbie and Chick taught me that intuition guides us all. 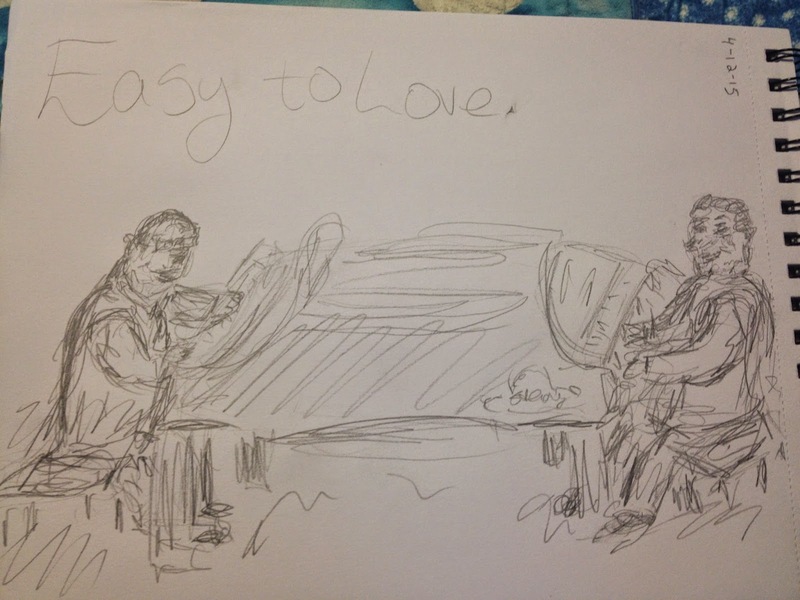 At one point in the concert, Herbie and Chick were just improvising, and then all of a sudden everything turned into a song, as they played, "Easy to Love" by Cole Porter. This amazed me, that they could both be complimenting each other, then a song could just form. This moment of the concert made me reflect on how jazz is really an intuitive art form. Musicians may obsess over their technique, and how they want to sound, but at the end of the day intuition and listening is what makes jazz interesting. Herbie could play one note that knocks me out of the park because it was the right note at the right time: you have to feel it. 3. Herbie and Chick taught me that taking chances is necessary to move forward. Both Herbie and Chick are known for their contributions to jazz fusion, and electric music. With this history, both had keyboard synthesizers next to their grand pianos. They brought us all into 'space and beyond' with the combinations of synth sounds and the grand pianos. This moment of the concert made me reflect on how music has grown and changed, yet always stayed the same at heart. Herbie and Chick took chances to make music what it is today, and their influences can be heard everywhere. 4. Herbie and Chick taught me that joy is what brings people together. The night of the concert was actually Herbie's 75th birthday! As a surprise Chick joked around and said, "I hear something in the air", as he started to play "Happy Birthday". Soon after, the entire audience joined along in singing to Herbie. Then, both went into a duo rendition of "Watermelon Man" followed by "Maiden Voyage". These moments in the concert made me reflect on why I love jazz. I find joy in jazz, and I think that's how music brings people together. To hear such famous songs played by the masters brought jubilance to the entire audience, and though the venue did not allow it, you could feel a dancing heartbeat throughout the hall. 5. Herbie and Chick taught me the power of passion. I think the biggest takeaway from this concert was the complete passion both Herbie and Chick have for music and life. The night ended with an encore performance of "Spain". This encore reminded me a lot of videos I've seen of Chick playing with Bobby McFerrin because of the level of audience interaction. At one point, Chick told the audience he was inspired by this one chord, and he taught each section of the audience a different note so we could sing as a choir. Also, Chick and Herbie would play phrases on top of the chords and the audience would sing them back. I can't think of a moment more fun than singing back what Herbie and Chick were playing! This moment of the concert taught me about simplicity and passion. Chick and Herbie would play simple phrases that we would sing back, and there was never any reserve about it. They played what they wanted to communicate, and the basis of that all was the feeling of passion. The more I reflect on this concert, the more I realize that this was a once in a lifetime experience. I am so grateful for the lessons I learned from just experiencing their music live. During Jazz Appreciation Month I urge everyone to go out and find jazz you love to listen to! Please visit my jazz poetry blog, "Without a Poem", where I improvise a new poem everyday. I also include jazz music and artwork, so stay updated! This week inspired my poem, "I wanted to change the world".